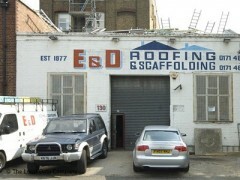 About: E & D Scaffolding & Roofing specialise in a range of roofing and scaffolding materials. First time i have dealt with this company and will not be the last ,great service from start to finish ,girls in the office kept me informed at all stages ,even got a coffee from erin when i went to see them ,well run family business. I've used them on at least 10 jobs since the 1980s including my own home. All the roofs are in good condition. Thoroughly recommend this family business. Having asked for the scaffolding to be removed they then took 3 weeks to come and dismantle it, and then tried to charge me for the privelege. Quite the most disgusting customer service I've experienced in a long time. I would NOT RECOMMEND this company under any circumstances. E&D scaffolding carelessly damaged my property while erecting scaffolding and subsequently refused to take any responsibility whatsoever, even though admitting their workers were to blame. They gave me the run-around for several weeks - assuring me that someone would call back and take care of the problem. Of course no one ever did. Finally when pressed, I got through to an extremely rude and discourteous "manager" who abruptly dismissed my complaint as trivial and of no concern. Furthermore he "didn't like my tone" and made numerous offensive remarks as to why I shouldn’t be bothering him. Quite appalling. Final word: employ these jokers at your own risk. The roofing company in NW London. We have used these guys for all our properties (were landlords) good service with fair prices.